Good morning! Today my friend will be visiting, and I am pretty excited since we rarely see each other. Perhaps I’ll have something to write about tonight regarding garden plans, but for now I just wanted to post about decorating our guest room. As you can see I didn’t change the paint or anything but only added some furnishings. 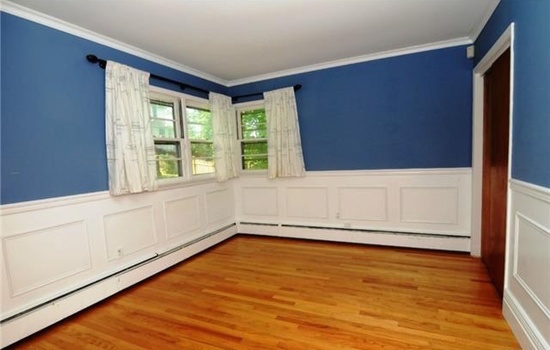 Eventually I plan to repaint, probably colour matching the blue, and using “coconut ice” on the paneling and trim. Besides that I’ll paint the door to the half bath, change the sink, mirror, faucet, light fixture, and door knob, and I’ll paint in there too. The bedroom is pretty much a decorating only sort of project, which is a nice break. So far the only new furnishings are the bed, mattress, and lamp. We were this close to getting a Restoration Hardware “Quatrefoil” iron bed from Craigslist and then from the outlet, but the one at the outlet was missing the side rails and slats. I kept checking with them, but no full sized beds came in before we needed to have one. My husband asked if I could just make a bed, but the materials would add up, (because if I was putting in all that effort I wouldn’t like to make something we would want to replace later,) and I didn’t really have time. Instead we went with the “Svelvik” metal bed from Ikea. It was just about as expensive as the “Quatrefoil” at the RH outlet, so I’m still pretty sad about it. Obviously they are both metal and provide a similar look, but the Ikea one shows its… quality. The undersides of the embellishments aren’t filled in, for example, so it just doesn’t feel as substantial or worth the money knowing that 60$ or so more would have gone so much further in quality. I also rather a lower foot board, and Ikea’s beds aren’t exactly the standard size, so the foam mattress must be squished with a lot of effort any time I remake the sheets. Grrr. On the other hand, I do actually like the finish and the brushed nickel finials look nice and tie in with bits of decor. So, there is that. These are the sheets. I almost went for the dark grey, because grey, but finally I accepted that the purple would really be a nicer choice. 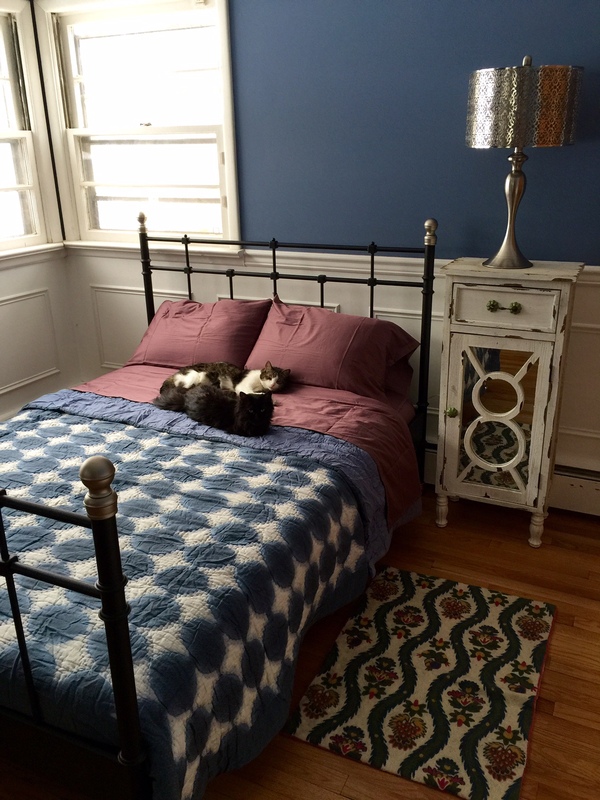 The quilt is a silk-cotton blend from Anthropologie that I’ve had for about ten years now. 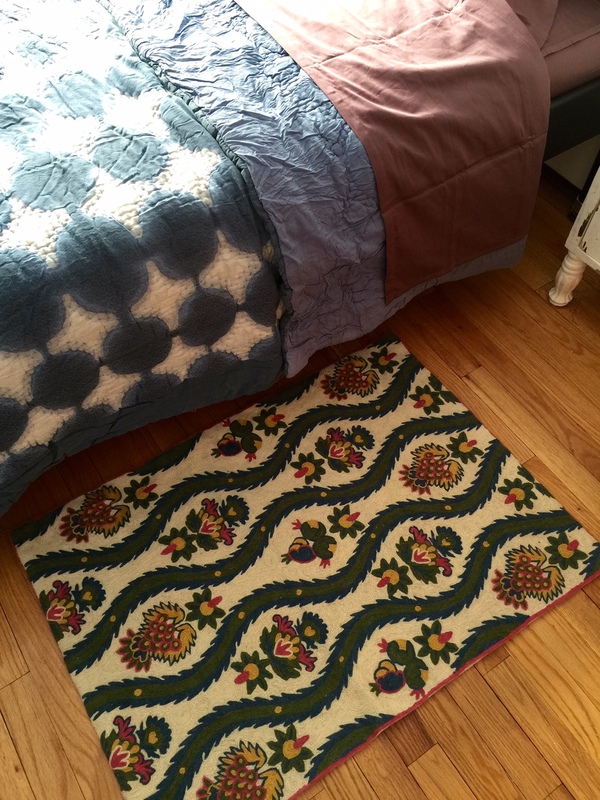 At the last minute before our guests arrived I added a colourful, wool embroidered, rug thinking it would be cheerful with the purple sheets and green ceramic knobs on the “nightstand.” The bedside cabinet used to act as our only storage in the tiny bathroom of our flat. I’m sure that after a while I’ll accumulate more furniture for this room, but for now we needed a place for the lamp. This room has no lighting aside from any lamps we add. This one was an impulse buy at Homegoods. When I saw the shade I had to buy it. The shade is metal with a pattern cut into it allowing one to see a pale lavender-grey fabric inner shade. It looks really pretty and interesting in person, and I like the added texture it brings to the room. Not pictured, yet, is an antique dresser and mirror in reddish tiger oak veneer that I scored a few years ago at my favourite Salvation Army thrift shop for only 90$. When I have done some more to decorate the room I’ll be sure to show you. The wood finish on the dresser is a big reason that I wanted to have an iron or painted bed. 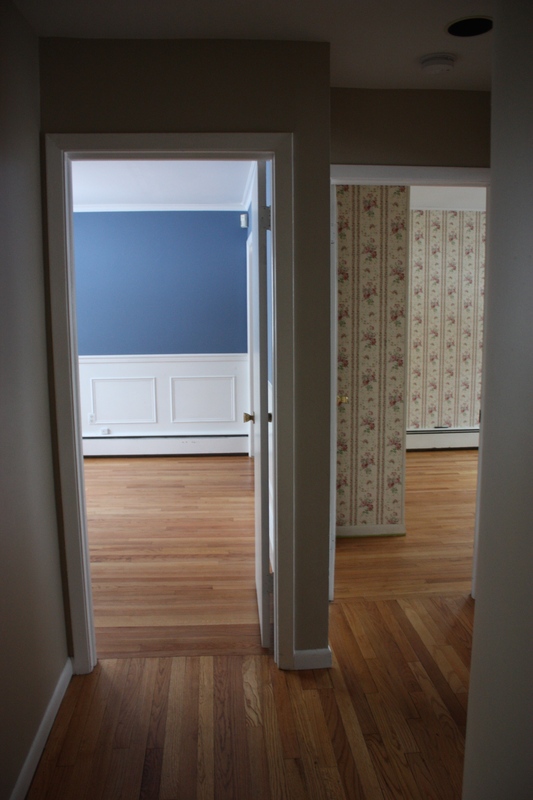 Matching or coordinating would be very difficult, and it doesn’t help that my husband doesn’t like that finish anyway. It does go beautifully with the blue walls though.